This book considers the interactions between Africa, Asia and Europe, analysing the short and long term strategies various states have adopted to external relations. The urgency attached to the agenda of international terrorism and human and drugs- trafficking has forced the European Union into new cooperation with Africa and Asia. These inter-regional relations have taken on new dimensions in the context of contemporary international politics framed by new security challenges, and new competitive forces particularly from Asia. This book provides both conceptual and empirical arguments to offer an innovative perspective on the EU as a global actor. It demonstrates how these three regions interact politically and economically to address global challenges as well as global opportunities, and thus provides an assessment of the multilateralism which the EU clearly stated in its Security Strategy paper. Addressing a broad range of topical issues, the book features chapters on European Security; European Migration Policy; African Union and its peace and security policy; Terrorism and international security; China and its fast growing global role; India, the biggest democracy in the world; and the impact of the Asian economic growth on the global economy. Further it compares the different backgrounds, forms and priorities of regional integrations. 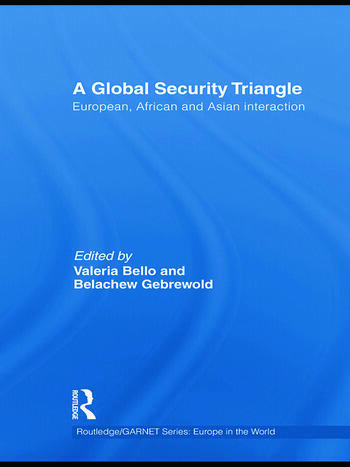 A Global Security Triangle will be of interest to all scholars of European politics, security studies, African and Asian studies, and International Relations. Valeria Bello is a researcher at the Jean Monnet European Centre, University of Trento, Italy. Belachew Gebrewold is Lecturer of International Relations at Helmut-Schmidt University, University of the Federal Armed Forces Hamburg, Germany.